Celebrate rituals and practices related to courtship, marriage and weddings in the spirit of Valentine’s Day. 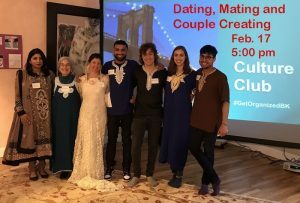 Through staged theatrical scenes, film clips, and interactive activities, we will explore and discuss a range of practices from internet dating to arranged marriages, marriage ceremonies and rituals and their meanings, and the complexities of interfaith marriage. Wear festive wedding attire (if inclined). Presented with Culture Club, performing arts and community building series created to foster understanding, initiate dialogue, and cultivate friendships through joyfully celebrating diverse cultures. A suggested donation of $10 is requested to support our space sponsor, Brooklyn Society for Ethical Culture. Register here.